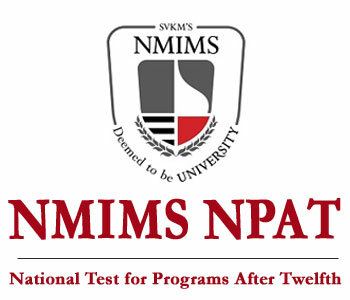 NMIMS University conducts university level exam, which is known as NPAT (NMIMS Programs After Twelfth). NMIMS NPAT Exam is the gateway for the admission into various undergraduate and integrated degree programs. After qualifying this exam, candidates will be getting admission in constituent schools of SVKM’s Narsee Monjee Institute of Management Studies at Mumbai, Bengaluru and Shirpur Campuses. The candidates who are taking up NMIMS NPAT 2018 May Exam can go through this Article which helps the candidate to get the complete information of NMIMS NPAT Eligibility, Important Dates, Registration, Pattern, Result and Counselling Process. Application form will be released on the 4th week of January. Final submission of the Application form will be on the 1st week of May. Admit card will be released on the 2nd week of May. Examination will be conducted on the 3rd week of May. Merit List will be released on the 1st week of June. Declaration of Result will be on the 1st week of June. The candidate who is willing to apply for can visit the official website and register themselves by filling the details. The candidate can fill the Application Form through Online mode. The candidate has to upload scanned Passport size photograph and signature in prescribed manner. The uploaded files should be in .jpeg format (file size should not more than 500 KB). The candidates should have passed the 12th class examination (i.e., 10+2 system) or equivalent subject. The candidates should secure minimum 50% marks in PCM for Mumbai campus and 45% marks for Shirpur campus. No. of Questions: Question paper consists of 150 Multiple Choice Questions. The paper consists of three subjects namely Proficiency in English language, Quantitative & Numerical Ability, Reasoning and General Intelligence. The Paper has Multiple Choice Questions. Each part has 50 questions comprising of 150 Questions. Negative Marking: 1/4th of the marks allotted to that question will be deducted for every wrong answer. The candidates can download their admit card via online mode. Candidates are required to get their Admit card along with the photo ID proof(original and photocopy) on the date of their examination. The Applicant details, venue of the test conducted, exam timings and details will be provided in the Admit card. Aspirants can access their result via online mode through the website. merit list will be prepared after the result declaration. The candidates have to keep the printout of the result till the admission procedure not over. Counselling starts from 3rd week of June. Candidates will be attending the counselling round based on the merit list. Candidates are required to attend the counselling/admission process in person. Counselling for B.TECH will be conducted in Mumbai campus.